Posting Hard Boiled movie in honor of Chow Yun-fat's 62nd birthday! Hard Boiled (Chinese: 辣手神探; pinyin: Làshǒu shéntàn) is a 1992 Hong Kong action film directed by John Woo. The film stars Chow Yun-fat as Inspector "Tequila" Yuen, Tony Leung Chiu-Wai as Tony, an undercover cop, and Anthony Wong as Johnny Wong, a leader of criminal triads. The film features Tequila, whose partner (Bowie Lam) is killed in a tea house gunfight with a small army of gangsters. One of the mob's high-ranking assassins is the undercover cop Tony, who must team up with Tequila for their common pursuit of taking down Wong's crime syndicate. The film leads up to a climax in a hospital, where the two must rescue innocent civilians and newborn babies from the maternity ward while fighting off dozens of mob hitmen. In Cantonese with English subtitles. 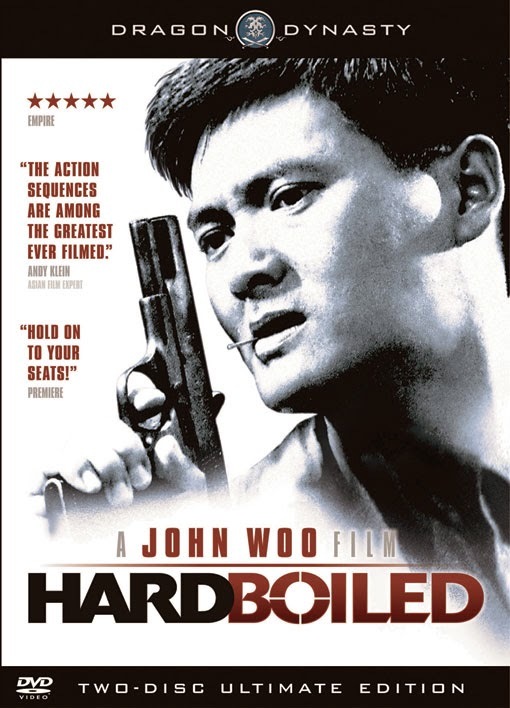 John Woo had previously been criticized for glamorizing gangsters in his films, so he decided to make this film glamorizing the police. During the filming of the scene in which Tequila is running down the exploding hallway with the baby, John Woo wasn't satisfied that the explosions were big and frightening enough in the scene. According to Woo in his Dragon Dynasty DVD interview, he asked the special effects technicians to reset the explosives and give him the trigger. When Yun-Fat Chow ran down the hall, Woo immediately set the explosives off, nearly incinerating Chow, who barely made it. According to Woo, Yun-Fat Chow exclaimed to the producer afterwards "John's trying to kill me! John's trying to kill me!". When Woo heard Chow screaming, he went up to apologize to Chow and saw that the back of his head and coat were in fact singed from the explosions. Using the shotgun in the rose box was an original idea in both this film and Terminator 2: Judgment Day (1991). It is a coincidence that they both came up with it at the same time. Its appearance in this film is not a reference to or a copy of "Terminator 2". It was used in two influential earlier films: Dog Day Afternoon (1975) when Al Pacino's character brings a rifle into the bank, and before that in Stanley Kubrick's film noir classic The Killing (1956), when the gang smuggles their heist gun into the track locker room hidden in a box of roses. More than 200 guns were used in the film, all of which were real. Due to Hong Kong's strict gun laws, the weapons had to be imported specially from England and inspected by the HK police before they could be used on set. The production also had to import a substantial quantity of blank ammunition; in total, over 100,000 rounds of blank ammunition would be fired during the filming of the movie. The now famous long take of Tequila and Alan shooting through two floors full of henchmen in the hospital lasts 2 minutes, 43 seconds. Because of the shooting schedule, the crew only had one chance to perform the continuous take during the gun-battle in the hospital. Many of Tequila's mannerisms (such playing the clarinet) were taken from a real cop John Woo interviewed for the film. Tequila's love of jazz is taken from Woo himself. The scene at the jazz bar after the teahouse shootout was added on the last day of shooting. Yun-Fat Chow wanted to have a scene that showed his real-life friendship with John Woo. The scene was scripted and shot in less than a hour. Like many of John Woo's other films, elements of the film's action sequences were improvised, such as the famous "staircase slide" in the teahouse. Yun-Fat Chow came up with the idea of using flour in the climax of the teahouse shootout. Originally, Phillip Chung-Fung Kwok (Mad Dog) [best known as The Lizard of Five Venoms] was not supposed to have an acting role in the film, instead just working as the action director. But John Woo was a fan of Kwok's acting work from the 70's and he felt Johnny Wong would not project enough of a real threatening presence, so he wrote in the character of Mad Dog and offered Kwok the part. Inspector Tequila is based on fictional super cops Inspector "Dirty" Harry Callahan from the Dirty Harry franchise and Det. Lt. Frank Bullitt from the Bullitt (1968), portrayed by Clint Eastwood and Steve McQueen. Like Tequila, they are portrayed as "all guys, no glory" heroes. Both fictional cops were inspired by real life SFPD Homicide Det Steve Toschi who gained fame as the lead investigator in the "Zodiac" homicides. Therefore, Tequila is the third movie cop to be inspired by and based on Toschi. John Woo wanted a jazz soundtrack in The Killer (1989), but was overruled by Hark Tsui. He got to do that here. The film took 123 days to shoot. The hospital scenes took 40 days to shoot. The statue that Tequila and the other police officers worshipped in the police station is of Guan Yu (aka: General Kwan, Taoist God of War). Guan Yu was a great military general, later an Emperor, during the Eastern Han Dynasty who was deified as early as the Sui Dynasty. Even today, General Kwan (in Cantonese, he is referred to as Kwan Gong) is still worshipped among Chinese people. Because Guan Yu is a guardian deity that exemplifies bravery, righteousness, leadership, protection and triumph, he is commonly worshipped by Chinese law enforcement agencies so that Guan Yu's blessings will protect them in life and in work. In Hong Kong, every police station has a shrine dedicated to Guan Yu (though worship of Guan Yu is not enforced). In the film's subtitle track, Guan Yu/Kwan Gong is incorrectly referred to as "Guana". Anthony Chau-Sang Wong wasn't happy with the film as he thought that his character, Johnny Wong, was a two-dimensional and thinly characterized villain. He also considered John Woo hard to work with.